British and American individuals and companies are among the offshore clients whose details will be contained on CDs presented to WikiLeaks at the Frontline Club in London. Those involved include, Elmer tells the Observer, "approximately 40 politicians". • Julian Assange has said it is "no coincidence" he gave cables from the US's embassy in The Hague to two Dutch media organisations. Dutch MPs are about to vote on whether to participate in a Nato police training mission in Afghanistan. Assange said: "If there is relevant material, it has to come out before they do." One story to come out so far is that Dutch civil servants urged US officials to pressure former Labour party leader Wouter Bos to support a continued military mission in Afghanistan. "They complain 'he just doesn't get it'," the cables says of the Dutch officials attitude to Bos. If you can read Dutch (or skip the Dutch and read the English quotes) RTL has a page on the Netherlands and the G20, with pdfs of relevant cables. • Question: what links Muammar Gaddafi and Teresa Scanlan, winner of Miss America 2011? The answer is they both made strong statements over the weekend against WikiLeaks. Gaddafi blamed the Tunisia uprising on cables written by "ambassadors in order to create chaos". In answer to a question on WikiLeaks at the pageant, Scanlan, who (more conventionally) also played the piano and wore a bikini, said the release of the cables "was actually based on espionage, and when it comes to the security of our nation, we have to focus on security first and then people's right to know." • Here is a link to Friday's WikiLeaks blog. 11.50am: The Elmer press conference is underway at the Frontline Club in London. You can watch it streaming on Frontline's website or its ustream channel. 12.03pm: Esther Addley tweets that Assange has arrived at the Elmer press conference and is fighting through banks of cameras to get to the microphone. 12.11pm: Assange is now talking: he is explaining how Julius Baer, Elmer's former bank, tried to use a US court in 2008 to take down the WikiLeaks.org domain. He said it was then WikiLeaks realised that the techniques it had developed to deal with Chinese censorship would be needed for operating in western countries too. The bank lost their injunction on first ammendment (freedom of speech) grounds with WikiLeaks supported in the case by US campaigners and media organisations, Assange tells the conference. He compares this to what he calls the "McCarthyist" state of play today. 12.12pm: Interesting: Assange says he does not know if Elmer is WikiLeaks' source or not. He says WikiLeaks is structured in such a way to make that impossible to know. 12.16pm: Elmer holds up the two CDs of data he is to hand over to WikiLeaks. He says his relationship is not with Assange but with WikiLeaks ("I'll say it again. WikiLeaks," he says) and his intention is not to reveal individual's names but to get the information looked at. Elmer also adds that he is taking full responsibility for the data. Assange is asked when the information will be released - he says it depends how long it takes to deal with, that the organisation is "attending to other matters". Assange says he won't be taking questions on his own legal process as it is Elmer's press conference – and the Swiss whistleblower himself has a court date this week. 12.36pm: The press conference to hand over the Swiss banking data - containing the offshore account details of 2,000 prominent people and companies - is now over, but here is a summary of some of Assange's later answers. • Assange says he wants to go the "safe route" and have professionals look at the Elmer CDs; he also says WikiLeaks has found "sources need to be protected before the information is passed out to others." • He says some journalists can be opportunists who "twist and hype up the material and distort the historical record" so WikiLeaks makes "primary source documents available so honest journalists rise high and dishonest journalists struggle." • He is also asked about the embassy cables release. Assange says 2.3% has been released and the process will continue over the coming months. 2.17pm: There is some scepticism in the comments and it is probably worth pointing out that, for the moment, only Elmer knows what is on the CDs. WikiLeaks presumably won't until its people have had a look at them. So despite this morning's events at the Frontline Club, which proves if nothing else that Assange is still in business, we don't really know how dramatic or not their contents will be. 2.45pm: Gregg Mitchell at the Nation reports that Norway's Aftenposten, which was leaked a set of the cables, has shared its cache with more media organisations. Die Welt, the German paper, has been named and there are three more to come, a contact at the paper tells him. The Aftenposten set has also been shared with Politilken in Denmark, Svenska Dagbladet in Sweden and the Dutch broadcaster RTL and newspaper NRC Handelsblad, as mentioned below. Keen readers may note that Assange has also said he gave the cables to the Dutch pair. 5.03pm: Cables published by the Swedish press have disclosed that the US made efforts to get two Swedish companies - Colenco and Mahacos - from working with Iran on civilian nuclear reactors. 5.30pm: There is a Canada connection to the Iranian nuclear programme too. In August 2009, the US told its Ottowa embassy to pressure the Canadian government into blocking the sale of Canadian company Forsys, owner of a uranium mine in Namibia, to Belgium company GFI. Washington feared that if GFI bought Forsys, Iran was more likely to be supplied with the uranium it sought. GFI's takeover of Forsys died for old-fashioned business reasons in August 2009 – because GFI missed several deadlines for transferring the money to pay for the takeover. But it's not clear whether Industry Canada's intervention to put the deal on hold a week earlier scuttled GFI's attempts to finance it. 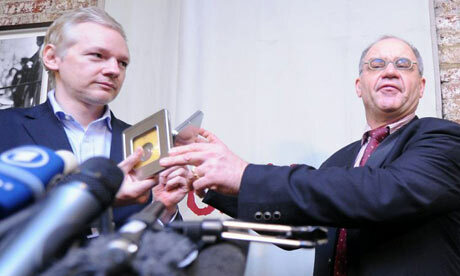 6.40pm: Assange and Elmer at the WikiLeaks press conference.